These late bloomers are worth the wait! When it comes to shady spots, ferns and hostas are obvious choices. 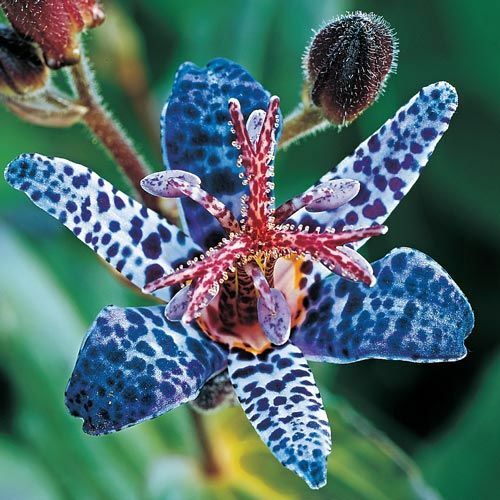 But neither can offer the unique blooms and exotic colour patterns of Tricyrtis, more commonly known as toad lilies! Just when many summer flowers are winding down for the season, these belated beauties start popping up in unexpected shady places—their spotted petals and rich colours adding interest to the late-summer landscape. 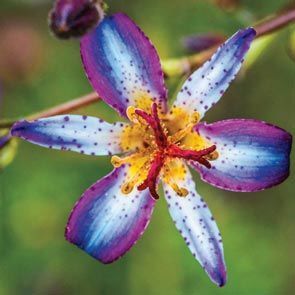 Toad lilies are native to woodland areas, but are ideal for shady borders and paths where their 1-2", orchid like blooms can be viewed up close. These low maintenance perennials require no staking or deadheading, and they are not troubled by disease or hungry deer. So find a shady spot and enjoy their speckled splendour each year from late summer to frost! Tricyrtis, or toad lilies, add colour and interest to areas of the garden that are often forgotten. 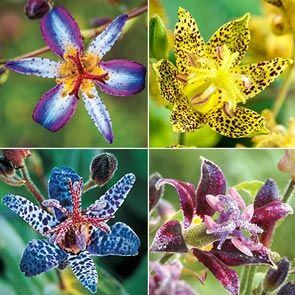 The four varieties we've "spotted" for our Toad Lily Collection feature rich jewel tones in unusual patterns—from mildly mottled to spectacularly speckled! Line your shady borders and pathways with these unique and easy-togrow perennials, and your late-summer landscape will come alive with exotic beauty that lasts for weeks! 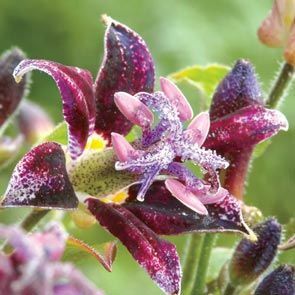 Raspberry Mousse A one-of-a-kind toad lily without the traditional toad lily spots! This vigorous grower sports star-shaped, rich redpurple petite blooms. Grows 24" tall. Blue Wonder The best blue toad lily we've found! 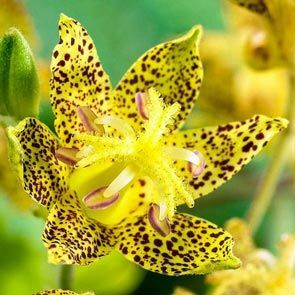 Cool, star-shaped, spotted blooms look like they were made for shade! Grows 24" tall. Taipei Silk Intricate flowers are more "freckled" than spotted, with blue and purple petals highlighted by a pop of yellow in the centre. Grows 18-24" tall. Golden Festival Our unique yellow variety stands out among blue and purple blooms—and there's hardly a space between its myriad maroon freckles. Grows 18-26" tall.